I am having the best time reading your comments and hearing how you would title a book about your life or what God has been teaching you over on the Giveaway Post! Please continue sharing your comments and posting to social media like Facebook and Twitter. I’ll be announcing the giveaway winners of two signed copies of Ask Me Anything, Lord this Friday! You can enter the Giveaway by clicking here and following the instructions. Originally published July 2, 2012 as Devotions from My Garden: What Are You Waiting for? So let’s not allow ourselves to get fatigued doing good. At the right time we will harvest a good crop if we don’t give up, or quit (Galatians 6:9 MSG). 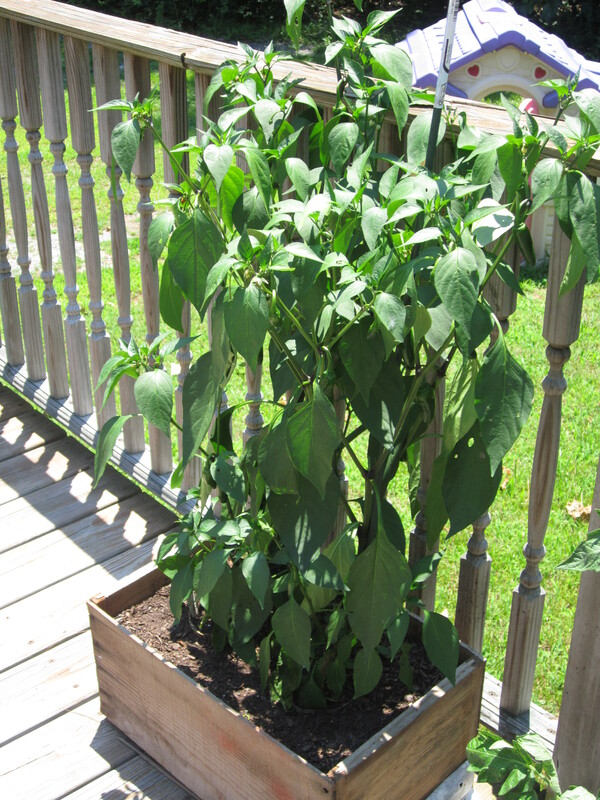 We planted in pots and crates on our deck, tiny seedlings of cucumbers, tomatoes in three varieties and jalapeno peppers. From one day to the next, the leaves didn’t appear to expand and the stems didn’t seem to reach any higher than the day before or the day before that. It took standing back and surveying growth over time for us to notice we had plants and not seedlings any longer. Then there were the first tiny yellow flowers on the cucumber plant. The day we spotted the tiniest baby tomato, I called all three of my daughters over to see. There we stood, a mom and three girls gently pushing aside green leaves to marvel at the promise of growth. For signs of ripeness and readiness for harvest. Gardening, like life, is so often about waiting. The difference, though, is that we waited for our first vegetables with anticipation and excitement. We tracked the progress and closely watched the physical signs of a promising future because we knew the day would come when we sat down to salad and salsa from our garden. But in life we often wait with a hopeless aggravation and a frustrating impatience. We wait on God, tapping our foot and glancing often at our wrists with urgency. Perhaps, though, we should wait for God, watching the signs of growth, rejoicing over every bud and clapping our hands with joy every time we see a reminder that the harvest is coming. “Now when Jesus returned, the crowds welcomed him, for they were all waiting for him” (Luke 8:40). Imagine the hush of the people. They weren’t whining about the wait or postulating that perhaps Jesus wasn’t coming after all. No, they were likely listening intently for the first sound of His voice chatting with His followers as He traveled on the road. This is how we wait for God–we look forward with excited anticipation and uncontainable joy for the moment we see God at work. And while we wait, we prepare to receive all that He’s bringing our way. “fill the ditches in the dry streambed with water” overnight and without wind or rain. Yes, He would bring the refreshment and victory they needed (2 Kings 3:16-18). In the very next chapter, Elisha tells the destitute widow to gather “empty vessels and not too few” and then the Lord filled as many as she gathered with rich oil, saving her from starvation and poverty (2 Kings 4:3). In two back-to-back passages, God miraculously fills His people up to the brim, giving them all they had prepared to receive. So we grab as many jugs and cups and bowls and pots and buckets as we can hoping not to miss out on one drop of God’s provision. We stand at the foot of the dry streambed and rather than complaining about our parched throat, we should dress in a swimsuit, ready to dive into the pools overflowing with His miraculous water-without-rain. It’s waiting still, surely, as we watch for the signs, the growth, the buds, the tiniest hint of what is to come. We look for God-movement here and there, projecting change and something new. It can be scary. Sometimes waiting is what we know. Change, even good change, can worry us. Or do we hang my shoulders in defeat and stomp away, not seeing the harvest quickly enough? Tired of waiting, we dump over the vessels waiting for oil or walk away from the streambed thirsty for water . . . turning away from those waiting for the first sight of Jesus and choosing instead to complain at home that He didn’t come. Or we could wait, joyfully and with excitement, nervous perhaps but ready nonetheless. Jumping up and down trying to see Jesus over the heads of the crowd, we could wait for God, not wait on Him. This is how we reap the harvest, when “we don’t give up, or quit” (Galatians 6:9). This is how we don’t miss out on one drop of what God has planned.